Given the season, all things dough are my new saving grace. I made this Chocolate Chip Challah for an article recently, and the double batch of left-over dough became this. An exceptionally decadent Spiced Chocolate and Halvah Babka. 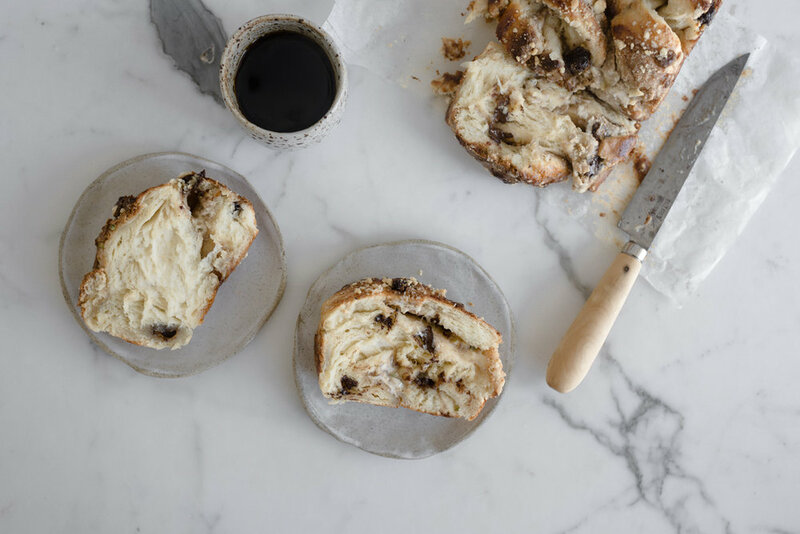 It’s a babka with a little unusual characteristic and plenty of inner sweetness to sate. There’s flecks of molten dark chocolate chips studded throughout the pillowed challah dough. A dough that’s ever-so light, aerated and tender. The lightness and softness of the dough shouldn't be understated. A mouthful is akin almost to the devourance of delicate clouds, if ever there was such a thing. 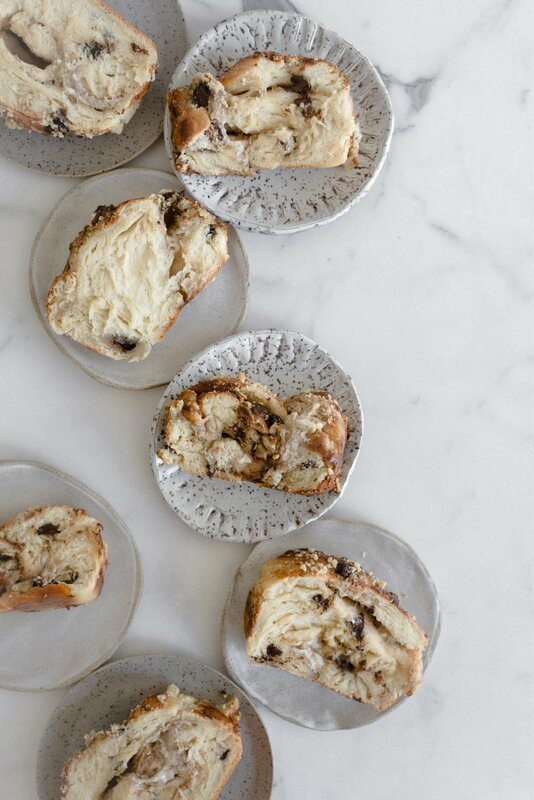 A slightly salted cinnamon white chocolate filling rests within the babka’s hypnotic folds. And a generous handful of crumbled halvah too, which disintegrates into the most addictive molten-sticky-mess. There’s a little streusel too. And a sticky-sweet hazelnut liqueur sugar syrup glaze. It’s the babka of clouds and dreams. Halvah is essentially sesame & sugar, in solidified form. It’s easy to find, both in store and online. I prefer to opt for a plain or nut-based halvah (the one I used here is studded with pistachios), though I can imagine that chocolate flavoured halvah would be something completely wild, as too would coffee. Before the white chocolate is spread over the dough, make sure that it’s cool enough to be handled. Let it sit on the kitchen counter until it reaches a lukewarm or body heat temperature before use. The white chocolate should thicken up considerably as it stands, which will render a babka that’s more controlled and easier to braid. If you find that your dough is slightly sticky, make sure to knead a teaspoon of flour into it at a time, until you reach a dough that’s soft, pliable with a slight amount of stickiness remaining. To make this babka simpler to braid, I prefer to let the dough rise until it’s doubled in size then knock it back and let it chill in the refrigerator overnight so it’s easier to handle. If you’re short on time, you could leave the dough to chill until it’s cool, about five hours, before using it. Place the water in a small saucepan set over medium-low heat. Heat, until it is lukewarm in temperature. Remove the saucepan from the heat and stir in the yeast until just dissolved. Set the mixture aside to proof, 5 minutes. Meanwhile, in the bowl of a stand mixer fitted with the dough hook attachment, combine the flour, sugar and salt. Mix, on low speed, to evenly incorporate the dry ingredients. In a separate large pouring jug, whisk together the eggs, vegetable oil and vanilla bean seeds. Pour the yeast mixture into the dry flour ingredients. Mix, on medium speed, until a rough and shaggy dough begins to form, about 1 minute. Set the mixer speed to medium-low. In a slow and steady stream, pour in the egg and oil mixture. Increase the mixer speed back to medium and knead until a very smooth and sticky dough has formed, 6 to 8 minutes. Pause mixing as needed to scrape down the bottom and sides of the bowl. Add in the dark chocolate chips and knead until they are just incorporated throughout the dough. Transfer the dough to a large and lightly greased bowl. Cover the bowl with a layer of plastic wrap then set it aside in a warm and draft-free place, until it has doubled in size, about 1 to 1 ½ hours. Once risen, knock the dough back on itself. Set the dough in the refrigerator to chill until completely cool, 5 hours or preferably, overnight. The dough should continue to slowly rise in the cool and controlled environment. When you’re ready to bake, make the filling. Place the finely chopped white chocolate into a medium sized mixing bowl set over a saucepan filled with an inch of barely simmering water. Do not let the base of the bowl touch the water beneath. Heat on low, and stir with a spatula often, until the white chocolate is melted and smooth. Remove the bowl from the heat and stir in the cinnamon and salt. 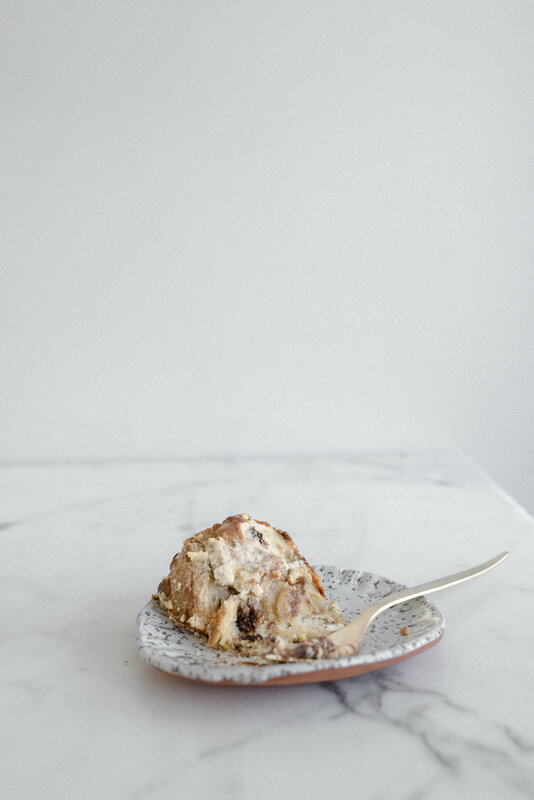 Let the salted cinnamon white chocolate filling stand on the kitchen counter until it cools to room temperature. Next, make the streusel. In a small mixing bowl, combine the flour, cinnamon and salt. Toss in the cold butter. Use your fingers to rub the butter into the dry ingredients until rough clumps begin to form. Set the streusel aside until needed. Grease and line a 22 x 13 cm (9 x 5 inch) loaf tin. Let the parchment paper slightly overhang the sides. Set aside. Remove the chilled dough from the refrigerator and set it out and onto a lightly floured surface. Knead the dough a few times to bring it together. Add a teaspoon of flour at a time, if the dough is slightly sticky still, making sure to re-knead it in well. Lightly dust the top of the dough with a little flour. Then, using a lightly dusted rolling pin, roll out the dough to form a rough rectangle, about 1.2 cm’s (½ inch) thickness. Using a butter knife or offset spatula, spread an even layer of the white chocolate filling over the face of the dough, making sure to leave a slight border from the edges. Evenly crumble over the halvah. Starting with the longest side of the dough, begin to tightly roll the dough up onto itself to form a neat log shape. Once rolled, turn the dough over so that the seam is facing down. Using a sharp knife, trim about 2.5 cm’s (1 inch) of the dough off the ends of the log. Then, starting at the top, slice the dough log in half. The layers of the dough should be visible and you’ll end up with two pieces. Begin to tightly twist the dough pieces over and under each other to form something that resembles a twisted plait. Gently pinch the ends together to seal. Carefully place the babka, braid side facing up, in the loaf tin set aside above. Loosely cover it with a layer of plastic wrap then set it aside to rise until just under doubled in size, about 40 minutes. Pre-heat the oven to 180 c (350 f). When the babka has risen, use a pastry brush to lightly coat the top of the babka with a little of the egg wash. Scatter over the streusel. Bake, for 28 to 32 minutes, or until golden brown and a skewer inserted into the middle comes out clean. Remove the babka from the oven and immediately pour over the sugar syrup (recipe follows). Allow the babka to cool in its tin for about 20 minutes, then set it out and onto a wire rack to either cool completely or slice and serve it. Place the sugar, water and hazelnut liqueur in a small saucepan set over medium-low heat, Heat, stirring often, until the sugar has completely dissolved. Increase the temperature to medium. Allow the syrup to just come to a simmer then remove it from the heat and use on the babka.